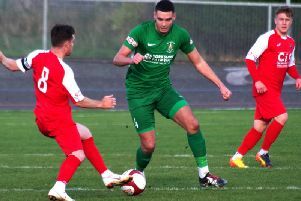 Shelf United are hot favourites for the Halifax AFL title after their main rivals Sowerby Bridge were beaten 4-1 at home by Shelf FC at Walton Street last night. Damien Watkins put leaders Sowerby Bridge in front but the lead was short lived as Andy Hawker levelled for reigning champions Shelf FC. Alex O’Keefe put Shelf in front before the home side’s Adam Barlow was sent off after picking up a second yellow card. O’Keefe then completed his second hat-trick in five days by adding a further two goals to seal an impressive win for the visitors. 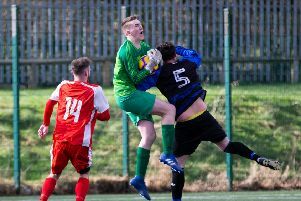 It was only Sowerby Bridge’s second league defeat of the season but they have now dropped 12 points and third-placed Shelf United have only dropped seven. The pair meet at Bridge next Wednesday. Shelf FC have dropped 13 points and will travel to play Shelf United in the last of their five remaining matches. Premier Division points: Sowerby Bridge (played 15) 33, Greetland (18) 30, Shelf United (12) 29, Hebden Royd Red Star (16) 29, Midgley United (17) 29, Shelf FC (13) 26, Sowerby United (16) 19, Denholme United (16) 13, Ryburn United (15) 7, Calder ‘76 (14) 4.